"Son of Jamaica" is how Bill Morris is described on a health centre plaque in rural Jamaica. 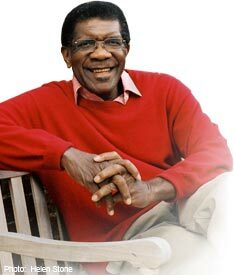 Born in Bombay, Jamaica, he came to England at 16 and began the steady climb which led to him being described as "probably the most influential black person in Britain". Best known as the General Secretary of the Transport and General Workers Union, his interests have spanned directorships of the Bank of England and the England and Wales Cricket Board, and his passion for education led him to become Chancellor of both the University of Technology, Jamaica and Staffordshire University, England; he has now retired from both posts. Bill Morris has been knighted by The Queen and awarded one of Jamaica's highest honours - the Order of Jamaica. In April 2006 he was awarded a life peerage and took his seat in the House of Lords on 13 June 2006, taking the title: Lord Morris of Handsworth. He now plays an active role in the work of the House. Design & Development by Debra Hamilton & Darius Karimi. ©2006.